Australian enterprise distie, DNA Connect, has been named Asia-Pacific distributor of the year by software company, Splunk. The award was presented at the recent Splunk Asia-Pacific partner conference in Macau. According to Splunk, the company recognises DNA Connect’s involvement in growing Splunk’s local business. This accolade also marks the fifth year in a row that the company has been awarded Splunk Asia-Pacific distributor of the year. DNA Connect Director, Munsoor Khan, said it found success with Splunk by simply understanding what the company does, and by being able to articulate that to the market in a way that resonates with resellers and customers alike. “In any partnership it’s important to be committed. But we do more than that because we’ve been working closely with Splunk for so long and we can articulate the various use cases to our partners and their customers well,” Khan said. As a company, he claimed DNA Connect constantly adapts to any changes Splunk makes to its go-to-market strategy and brings that message across to the channel effectively. He added that helping disruptive vendors work into the market and investing heavily in technical engineers and presales support is part of DNA’s heritage. DNA’s commitment to its vendors benefits resellers too – and that’s another key reason behind DNA Connect’s distributor of the year win, Khan mentioned. “As a value­-added distributor that has eased many new vendors into the market, DNA Connect understands what it means to be a growth business, and the changes these businesses need to make to find new opportunities,” he added. 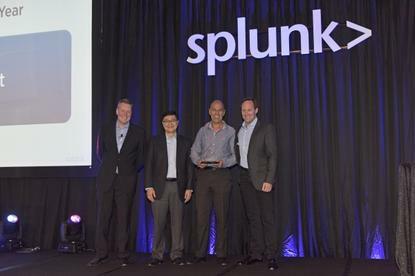 DNA has now won Splunk’s Asia-Pacific distributor of the year award for five years in a row.